Hon'ble Minister of State (Independent Charge), Ministry of Youth Affairs And Sports, Mr. Vijay Goel met the junior men’s Indian hockey team that recently won the Uttar Pradesh Hockey Junior World Cup Men Lucknow 2016 at his residence in Ashoka Road on Wednesday. The victorious side that beat Belgium 2-1 in the Final created history by winning the title after a gap of 15 years. The team had an unbeaten run in the tournament where they got the better of the likes of Australia in the Semi Finals, Spain in the Quarter Finals as well as Canada, South Africa and England in the pool stage. Congratulating the team for their efforts, Goel announced a cash incentive of Rs 3.70 lakhs per player. “Each one is a gem and I wish them all the very best for future,” Goel said. He later spoke individually to some of the players. 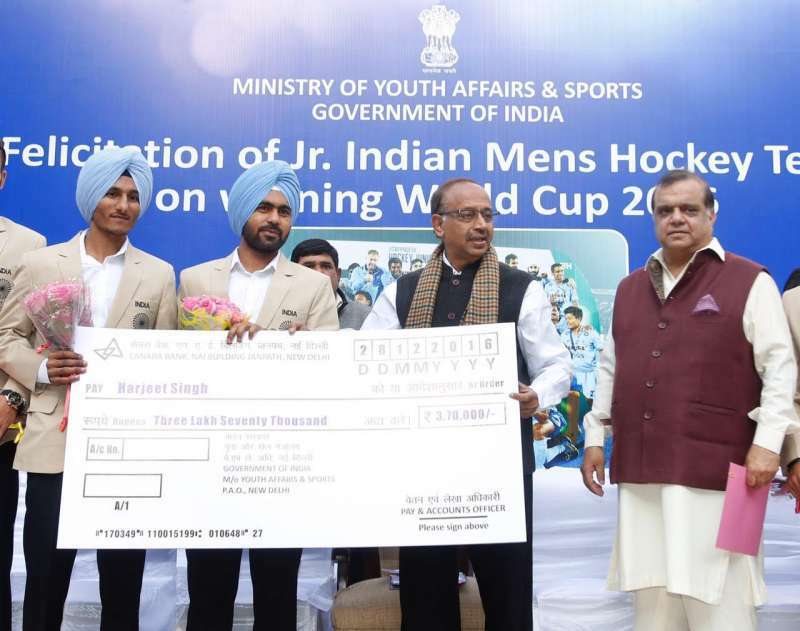 On his interaction with the Hon'ble Minister, Team Captain Harjeet Singh replied, “Minister Sir said that when he learnt that we had entered the Final, he wanted to come and watch the match in Lucknow but due to prior commitments he could not make it happen. “However, he said he followed most of our matches and wished us the very best going forward and asked us to stay focused,” Harjeet added.